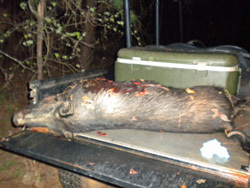 What do you do when a feral hog is “destructing” your property? You make him in to a good, tasty hog. Here’s the story. Paul got a call from his neighbor to help him out. Fortunately for Paul our camp’s New Holland Rustler got in on the action and made transportation a snap. A neighbor alerted us to the fact that he and his wife have seen 2 separate groups of hogs rooting and “destructing” on our land and his. We’ve not historically had a hog population in our woods, but evidently the deer food sources have brought them to us. At least 3 of the hogs sighted were described as “enormous”, and we are now on full alert. A phone call at 11:30P woke me up with the same neighbor’s voice asking, “So you want a hog? Come get him!” I got dressed, loaded butchering equipment into the New Holland Rustler and headed through the woods to find my neighbor with a celebratory drink in one hand and a flashlight in the other. We loaded the hog he’d shot, estimated at 150-200lbs into the Rustler and drove to our hanging spot. He said this was one of 3 in the group (passel of hogs? flock? pack? gaggle? No, gaggles are reserved for geese…) In any case, this was the smallest hog in the _______ (you fill in the blank!). This job was not as easy as skinning and cleaning a deer, but the result was well worth the effort. I found myself in the wee hours of the morning with a celebratory drink in MY hand, and a cooler full of wild hog meat! Gotta run…the smoker is calling my name…!